Staats, Linda ; VanEvery-Albert, Claudine ; Bomberry, Ruby. Interim Six Nations Education Authority Working Group ; Six Nations Elected Band Council ; BOMCOR Associates ; Indian and Northern Affairs Canada ; Tewatatis ; Tekawennake News ; Turtle Island News. The following is a short summary of education happenings in our community. The ISNEA Working Group will provide updates periodically or as important events occur. 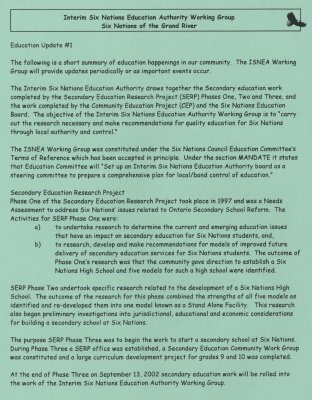 The Interim Six Nations Education Authority draws together the Secondary education work completed by the Secondary Education Research Project (SERP) Phases One, Two and Three, and the work completed by the Community Education Project (CEP) and the Six Nations Education Board. The objective of the Interim Six Nations Education Authority Working Group is to "carry out the research necessary and make recommendations for quality education for Six Nations through local authority and control." The ISNEA Working Group was constituted under the Six Nations Council Education Committee's Terms of Reference which has been accepted in principle. Under the section MANDATE it states that Education Committee will "Set up an interim Six Nations Education Authority board as a steering committee to prepare a comprehensive plan for local/band control of education." b) to research, develop and make recommendations for models of improved future delivery of secondary education services for Six Nations students. The outcome of Phase One's research was that the community gave direction to establish a Six Nations High School and five models for such a high school were identified. SERP Phase Two undertook specific research related to the development of a Six Nations High School. The outcome of the research for this phase combined the strengths of all five models as identified and re-developed them into one model known as a Stand Alone Facility. This research also began preliminary investigations into jurisdictional, educational and economic considerations for building a secondary school at Six Nations. The purpose SERP Phase Three was to begin the work to start a secondary school at Six Nations. During Phase Three a SERP office was established, a Secondary Education Community Work Group was constituted and a large curriculum development project for grades 9 and 10 was completed. At the end of Phase Three on September 13, 2002 secondary education work will be rolled into the work of the Interim Six Nations Education Authority Working Group. The Six Nations Education Board ended its work in August 1994 and Indian Affairs maintained its overall responsibility for elementary education and does so today. 3. provide a practical implementation guide for possible change and recommendations. 1. that the current elected Band Council, through its organizational protocol, establish an interim community-based Six Nations elementary education authority to facilitate the revitalization of elementary education service at Six Nations. 2. that a Memorandum of Understanding (MOU) be developed for an education authority, to identify the roles and responsibilities of both parties. 3. that INAC provide immediate funding for the Operation and Maintenance of an education authority and the staffing of a Superintendent position for the Elementary schools. Budget to be established and developed by the Education Authority. 4. that the Elected Band Council facilitate a decision-making process to decide on the issue of assuming the administration of Elementary services in the Six Nations community. In the new Six Nations Council's portfolio system, Linda Staats was given responsibility Education and following the March 2002 BOMCOR Elementary study, Ms Staats called a series of meetings of those persons who had been involved with the Secondary Education Research Project (SERP) and the Elementary Education study with a view to bring the two groups together and request funding from INAC to begin the process of setting a Working Group to carry out the research necessary, develop a comprehensive plan and make recommendations for quality education for Six Nations through local authority and control which is now the mandate of the Interim Six Nations Education Authority Working Group. 1. review all information and research prepared by the previous Six Nations Education Board (SNEB) to determine what can be revised and what needs to be developed for implementation of a functional Six Nations Education Authority. 2. develop a questionnaire and research tool for data collection of pros and cons of other First Nation education authorities. 3. develop a questionnaire for research tool for community data collection. 4. implement data gathering information into report and recommendations for decision-making. Bid applications were advertised in early June 2002. The contract, won by TEWATATIS Education Consultants owned by Claudine VanEvery-Albert an experienced educator in our community, started at the end of June. The TEWATATIS' recommended strategy for proceeding with elementary and secondary education will be presented by October 18, 2002 when the contract is concluded. The next meeting of the ISNEA Working Group will be held at Six Nations Polytechnic on Thursday August 29, 2002 at 9:30am. All are welcome to attend. The Working Group will be discussing its Terms of Reference and vacant seats on the committee. In addition, the ISNEA will be discussing future plans, budgets, Board Development, a Critical Path, and upcoming education conferences.